This was supposed to be a week of positivity for the Football Association of Ireland. Mick McCarthy is back on the training ground today ahead of the opening Euro 2020 qualifiers with Gibraltar and Georgia. The Abbotstown authorities would expect a win in Gibraltar on Saturday to build the buzz around the home date with Georgia at the Aviva Stadium three days later. Three weeks ago, McCarthy was front and centre as the FAI launched its new range of premium tickets to cover the next five to 10 years. Chief executive John Delaney admitted that mistakes had been made with the pricing of the first batch of 10-year tickets when the renovated stadium was opened. It has been well documented that the decision to go to the markets with tickets costing between €1,200 to €3,200 per year simply did not work out. And that left the FAI with substantial bank debt that it has been seeking to clear for the guts of the past decade. At the launch of the new round of tickets last month, Delaney outlined what customers would be doing by buying into their latest scheme. In addition to guaranteeing their seats for the next 10 years, they would also be "putting money into the game and also servicing the debt". It was a statement that reflected the struggles of the recent past, but the overall message was about looking positively to the future. But as the great and good of Irish football gathered at RTÉ studios last evening for the FAI International Awards for 2018, there was only one story dominating discussions. And it relates to the curious case of the €100,000 bridging loan provided to the FAI by its CEO, Delaney, in April 2017. The association admitted the transaction had taken place in a statement that was released on Saturday night ahead of the publication of an article in the 'Sunday Times'. We know that there were legal attempts to stop that story from being printed. 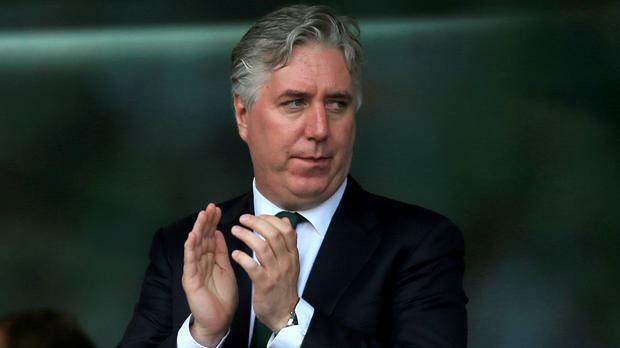 An FAI statement said that Delaney was aiding a "very short-term, cash-flow issue". No further details were provided, other than the confirmation that the amount was repaid in full in June 2017. It's an extraordinary tale that raises numerous questions. The timing is of particular interest. In the summer of 2017, the headline story out of the FAI AGM was the association's record turnover in 2016. This was the year when Ireland's qualification for Euro 2016 and subsequent progress to the round of 16 was worth in the region of €11m to the FAI - although bonus costs to staff and players would have reduced the bottom line. "There's a good spread of income generated," said Delaney. "I think in general, we're increasing our base of revenue generation. And we're reducing the debt, which is key." He also referenced increased season ticket sales in a year when Ireland played a number of key World Cup qualifiers in Dublin. Still, we now know that an association with a turnover of €49m for the year have stated that they were in a position where they needed a €100,000 loan from an employee. A clear explanation for this bizarre situation is needed. The suggestion Delaney was able to dig into his own pocket brings his €360,000-a-year salary back into focus. His earnings are also supplemented by a six-figure remuneration for his work on the executive committee of Uefa. Saturday's statement added that Delaney had donated his Uefa fee for 2018 back to the FAI. Again, the timing of that revelation is eyebrow-raising. Delaney's salary will be on the agenda when he appears in front of an Oireachtas committee on April 10 to answer questions on governance. The FAI is in the process of reforming the make-up of its board to comply with criteria laid down by Sports Minister Shane Ross. The forthcoming hearing has been rescheduled twice. Given that the FAI is in receipt of State funding, his inquisitors should have plenty of questions to ask.